THOUSANDS of George Michael fans from around the world flocked to Goring to mark what would have been the singer’s 55th birthday. 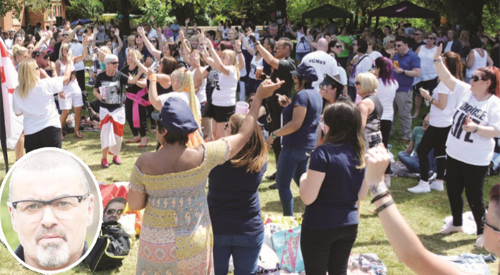 The village hosted two days of fund-raising celebrations at the weekend, which included a music festival at the Catherine Wheel pub in Station Road on Saturday and a free party and picnic in Rectory Garden, off High Street, on Sunday. The streets were packed with visitors dressed as Michael from various phases of his career. Many wore the uniform of the Los Angeles police force, which the star had on in the video for his 1998 single Outside, while others dressed in leather jackets and aviator sunglasses like those he wore for his 1987 hit Faith. 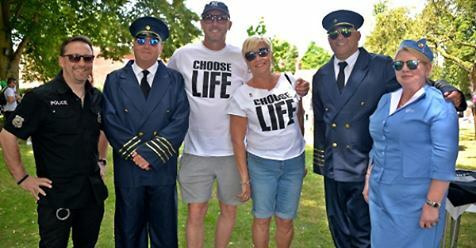 Some donned T-shirts bearing the slogan “Choose life”, which he and singer Andrew Ridgeley popularised as Eighties pop duo Wham! The pub festival featured local artists including The Mysteries, Spooks, Rush Keeper and Heather Jayne and the Red Shoes and George Michael tribute act James Bermingham. It was named Spinning The Wheel after Michael’s 1996 single and is expected to have raised at least £1,000 for the Terrence Higgins Trust, an HIV and sexual health charity that he supported. Vanessa Cooke, who runs the pub with Katrena Derricourt, said it was a success and most fans were respectful but one became drunk and abusive and police had to be called. She said: “Overall it was brilliant as we must have had at least 1,000 people through the doors. Sunday’s party included two sets by George Michael tribute act Pete Valentine and a third by Elton John impersonator Andy Crosbie, who performed with a grand piano. Between acts DJ Jade Dickerson played a selection of Michael’s hits as the crowd danced and took selfies on their mobile phones. The action was broadcast live on various George Michael fan websites. There was an auction of memorabilia including a series of prints donated by photographer Chris Cuffaro, who worked with Michael in the Eighties, in aid of ChildLine, which the singer supported. The sale was hosted by Bargain Hunt expert David Harper. Dame Esther Rantzen, who founded the charity, sent a personal message of support. Organiser Terry Daniels, from Milton Keynes, read out greetings from former Wham! backing singer Shirlie Kemp, the wife of musician and actor Martin Kemp, and the Duke and Duchess of Cambridge, whose charitable trust received the proceeds from Michael’s 2011 cover of Stevie Wonder’s You and I. A book of condolence was opened at St Thomas’s Church, where fans could go to rest, reflect or pray. Gift shop Inspiration was selling toys and memorabilia and staff from the Chocolate Café in High Street ran a barbecue and bar. Café owner Vivienne Lee said: “What an event to be part of — it was utterly amazing how one person could attract such a devoted following. We were asked to provide the catering by his housekeeper, who is a regular, and that was a real honour. “Although we were working hard it was a fabulous day. Sales were very high and I imagine everyone ordered a hot dog or burger at some point while we set a new record for footfall and takings in the café. “We’ve got a cult reputation among his fans as we were the only place that was open in the days after his passing. They’re a lovely bunch of people and a real pleasure to serve. They like to drink and have a laugh but are always very respectful. Jeanne Hunter, who owns Inspiration, said: “We had a great time and raised £260 for ChildLine. Last year there was still a sense of sadness at the loss but this year felt much more like a celebration and it’s great that something positive can come out of a tragedy. Visitors came from as far as eastern Europe, Australia and America to pay tribute to the singer, who was found dead at his cottage off High Street on Christmas Day 2016. His death was found later to be from natural causes. The festivities finished at about 7pm with a mass blowing of bubbles outside Mill Cottage, Michael’s former home. In keeping with the family’s wishes, most people did not leave floral tributes there. That evening tribute act David Ellis Wright performed a sold-out show at the village hall called You Have Been Loved. This was followed by a final candlelit vigil at the cottage. Mrs Daniels said: “It was an absolutely flawless and phenomenal event which everyone enjoyed, from the fans to the businesses and residents of the village. “We did have two complaints on the day, for which I’m genuinely sorry, but we were within the noise limits and worked very closely with the police and South Oxfordshire District Council as the licensing authority to make sure we respected the community. Parish councillor Bryan Urbick said: “Most of the feedback I’ve received has been positive. It was good-natured and respectful and they followed all the rules. “That said, there were four or five complaints about noise and we do take those seriously.